Yesterday a mother entering a Planned Parenthood abortion facility seeking an abortion was rushed to a hospital in what it looks like is a botched abortion. Her health status at this moment is not known. 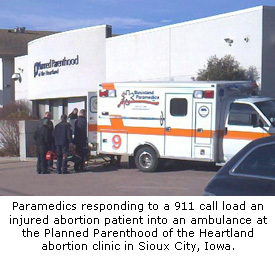 The abortion was attempted at Planned Parenthood of the Heartland in Sioux City, Iowa. Abortionist Nicola Moore, who flies in from Massachusetts to perform abortions at this facility is suspected to have botched this abortion. Abortion not only is the taking of an innocent, young human person’s life but it is very dangerous for moms – sometimes even sending them to the hospital. Abortion facilities are typically not forced to uphold the same safety standards of other medical facilities. Please pray for this mother. Also pray for Nicola Moore and all who participate in abortion at this Planned Parenthood. Pray that they will see, through this botched abortion attempt that abortion is a heinous crime against humanity and that they will leave the business, like so many others have done. Operation Rescue broke this story. Help us spread the word. Please like, comment and share. THANKS! Many in the pro-life movement have known for years that the abortion advocates’ mantra of “safe, legal and rare” abortion is a ruse. Obviously it’s not safe for anyone involved nor is it rare. Planned Parenthood will tell you that they are out to prevent abortion by preventing pregnancy and that abortion services are only “3 percent” of their total services. Yeah right. Well, one of their former clinic managers has come out and shed some light on this issue. In this interview Sue Thayer, who was fired three years ago and has led a prayer campaign outside her former clinic, comes out and shares what it is like to manage a Planned Parenthood abortion facility. It became increasing clear over the years (12 total) that Planned Parenthood wasn’t about preventing or reducing pregnancy. “Abortion became a number, a goal,” Sue said, “managers are accountable for that goal.” So, if Planned Parenthood is so about preventing or reducing abortions why are abortion goals set? And why are managers held accountable for those goals? Shouldn’t the number of pregnancies avoided be the goal? NO! 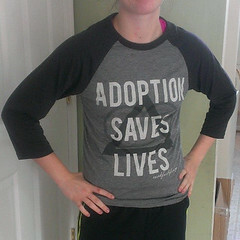 Because abortion is their goal! Sue goes on to say that as part of her training she was forced to observe a full day of surgical abortions. Because Sue was personally opposed to abortion this gave her more drive during the following twelve years to prevent pregnancies and abortions. Eventually the ruse became clearer and clearer. Her Planned Parenthood facility did not provide surgical abortions, but eventually they introduced telemed abortions – abortions where a doctor from a different facility would determine if a mother was less than 63 days pregnant. If so, the doctor would assist in administering the abortion drug RU-486 through webcam. The idea was to introduce this form of abortion to her facility and eventually make it available to every single “family planning clinic” in the nation. Therefore greatly increasing the abortion rate. Once the telemed abortions were introduced at her facility she vocally opposed it – “we are not about abortion, we are about family planning – we prevent abortion.” She was shortly thereafter “laid off.” An ad for the vacant job soon appeared in the local paper. So as you can see Planned Parenthood is about abortion. Abortion is a highly profitable business for them. 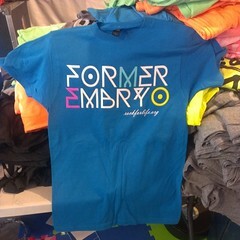 In order to stay in business they need to sell their product – abortion. Another interesting admission she made is that Planned Parenthood really does not like 40 Days for Life. So out of curiosity she signed up for their email list. When she was fired from Planned Parenthood she eventually went to 40 Days for Life and led the fall 2011 prayer campaign in front of her former clinic! Prayer works folks! We need to shut down Planned Parenthood. One of the ways is to share what Planned Parenthood is really about . Please listen to the interview and share this article on all your social network avenues. Thank you. I (obviously) am not a fan of abortion. Most people aren’t. All abortions kill a human person and leave another (the mother, sometimes the father and other family members) scared physically, spiritually, emotionally, or all of the above. But one thing is for sure – Most people REALLY aren’t fans of late-term abortions. Can you blame them? A late-term in-utero baby looks much more like you and I as opposed to a first-trimester baby. Doesn’t make it worse. Killing is killing. It’s fascinating to see the latest outrage against late-term abortions. Leroy Carhart, a late term abortionist started performing his specialty Monday, December 6th in a new location – Germantown, Maryland. Over 600 pro-lifers showed up on opening day to pray and be a public witness. That is an awesome showing. I was very impressed. 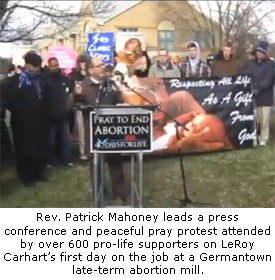 Then, the first Saturday of his business (Dec. 11th) over 600 pro-lifers showed up to pray and to be a public witness. Again, awesome! Last night, (Dec. 13th) over 150 reported pro-lifers showed up at a City Council meeting in Council Bluffs, Iowa to protest another proposed late-term abortion facility opening up by, you guessed it – Leroy Carhart. Again, major awesomeness! 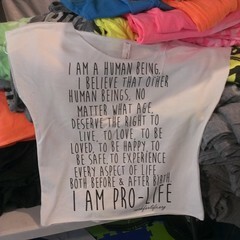 So, as you can see late-term abortions really rile people up – and rightfully so. But aren’t all abortions the killing of a human person? Why does the killing of a late-term abortion freak everyone out but not so much as when his or her younger brother or sister is being terminated via abortion? Aren’t all human persons equal regardless of age / level of development? I don’t mean to be a downer. I am really excited that so many people are coming out to oppose abortion. But where are these same people when it comes to first-trimester abortions? If abortion kills a human person and we really believe that, then we should be just as horrified when a 12-week old baby in-utero is killed as a 22-week old baby in-utero.